A retrospective on the legacy of Rare to uncover why Yooka-Laylee is truly something special. In just over one week, newly established company Playtonic Games crowd funded well over two million dollars – eight times more than their original goal – for the development of the spiritual successor to 3d platformer Banjo-Kazooie, Yooka-Laylee. The instant support of more than 43,000 gamers worldwide is of no mystery, as Playtonic is lead by a team of former Rare Ltd. developers who were responsible for some of the most acclaimed and beloved games on the Nintendo 64. 15 years since the end of the N64 era, younger gamers may be unfamiliar with the 30-odd year legacy of the British developer Rare Ltd.; though it’s a legacy no less. Here, we take a look back at the myriad of successes Rare has achieved since the mid ’80s to piece together why the development of Yooka-Laylee is truly the revival of something great. In 1985, British PC game developers and brothers Chris and Tim Stamper had a career changing moment whereupon getting their hands on the Japanese Nintendo Family Computer (Famicom), the brothers decided it was console gaming rather than arcades or personal computers that would be future of the video game industry. The Stampers immediately set their sites on developing their next games on Nintendo’s 8-bit console, only there was one problem: When it came to developing games, Nintendo of Japan was profoundly patriotic and skeptical of letting non-Japanese teams create software for their system. The company was happy to trust other countries with marketing and distributing their products, but staunchly believed development should stay in Japan. Rather than throwing in the towel and sticking to computer games, the Stamper brothers decided their only option was to reverse-engineer the Famicom to illegally and secretively create games for it, then present their work to the top dogs at Nintendo of Japan. A risky move indeed, but Nintendo was so impressed with their work that this early version of Rare now had full approval to develop as many games as they saw fit for the Famicom and NES. Of course, this was groundbreaking for two reasons. First, in the ’80s, Nintendo only allowed third party developers to create six games a year in an attempt at quality control, not wanting to oversaturate the market like Atari and other companies had done only a few years earlier. Now, Nintendo put enough trust in Rare that they had full creative control over their games and how many they would release a year. Second, and more importantly, Rare was the first company Nintendo trusted to develop games for their consoles outside of Japan, paving the way for an international community of video game developers in the decades to come that may otherwise have not had the opportunity to work with the Japanese juggernaut. In 1989, Nintendo controlled roughly 95% of the total market share in the North American video game industry. But after years of aggressive marketing efforts lead by Sega of America’s CEO Tom Kalinske, by 1994 Sega and their friend spiky blue friend Sonic had turned the tides on Nintendo, reducing the Big N to a company claiming less than 45% of all 16-bit console sales. With Nintendo being portrayed in the media as the childish, less mature company (games like the SNES version of Mortal Kombat received heavy censorship not seen on the rival system, the Sega Genesis), Sega had seemingly dethroned Nintendo and was ready to take things to the next level by working on a next generation 32-bit console. In the fall of 1994, at a time when many assumed the Super Nintendo was out of gas and was well passed its prime, Rare unleashed Donkey Kong Country. The game, while perhaps visually dated by today’s standards, at the time boasted graphics unparallelled by anything on the Sega Genesis or elsewhere, and breathed new life into the SNES. Sales for the Super Nintendo skyrocketed back up after Donkey Kong Country released, giving Nintendo all the time they needed to fully develop their next gen system while keeping players happy and occupied with their current consoles. This luxury of time was something that Sega couldn’t afford, and they suffered greatly for it; With the Genesis reaching it’s limits and the system’s major software releases all behind it, The Sega Saturn was rushed to market in a last ditch effort to keep consumers interested in Sega. The rushed release backfired, and the Saturn was met with mediocre reviews, a lack of “system selling” games, and most importantly for Sega, a strong advertising campaign. It seemed oddly full circle that it was Donkey Kong, the character that first made a name for Nintendo in the U.S. thanks to his hugely popular arcade cabinet games, had now returned to save his creators in their most trying of times. The generation of consoles from the late 1990s that the Nintendo 64 belonged to is arguably among the most seminal eras in video games, as it was this generation that gave rise to fully realized three dimensional gaming. Though 2D side scrollers and overhead camera franchises still exist, it’s hard to deny that games set in 3D worlds have become the precedent for nearly all modern releases. One of the most well received genres to emerge from the dawn of 3D landscapes was the 3D platformer. Games like Super Mario 64 opened players’ eyes to entirely new possibilities in gaming, and are still revered to this day. With Rare dominating the 2D platformer genre after the success of the Donkey Kong Country series on the SNES, it seemed only right their next mission should be to enter an entirely new setting and take on the challenge of creating their own 3D platformer. Unsurprisingly, given the company’s past track record, the games that Rare developed for the Nintendo console proved to be some of the highest rated titles in the console’s library. In 1998, the company responsible for the likes of Battletoads and Killer Instinct created yet another iconic franchise to usher in a new era of success, the 3D action platformer Banjo-Kazooie. The game was wildly celebrated from the get go; players instantly took to the wonderful character designs of Banjo and Kazooie created by Steve Mayles, the memorable and at the time unparalleled score composed by Grant Kirkhope, and above all else the exceptional game design made possible by Chris Sutherland and the rest of the Rare team programmers. Many have argued that Banjo-Kazooie rivaled – or even surpassed – Super Mario 64 as far as 3D platformers came, and Rare had only gotten started. The following year, the team opted to revisit the jungles of Donkey Kong and released Donkey Kong 64 for the N64. Lead character artist from Banjo Steve Mayles was responsible for designing the look of the modern Kong family. His take on the DK crew was so accepted that to this day no games involving DK and co. have shied too far away from his designs. In terms of platformers, Rare continued to hit home-runs on the N64 thanks to the likes of Conker’s Bad Fur Day and Banjo-Tooie, yet their success was not limited to a single genre. 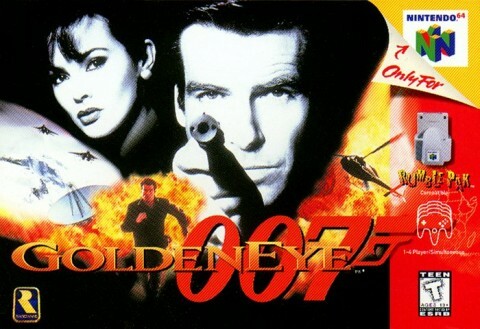 Rare also developed a handful of well received first and third person shooters, not the least of which was Goldeneye 007. The game, while admittedly frustrating to play for shooter fans today who are used to the luxury of two control sticks, redefined and revitalized console shooters. Not only this, Rare broke an age-old curse with Goldeneye by developing a game based off of a movie franchise that not only did justice to the film, but proved to be one of the best games of its generation irrespective of its film origins. By the dawn of the new millenium, Rare Ltd. was at the top of their game. A new generation of hardware was in reach with the impending arrival of the GameCube, Xbox, and PlayStation 2, and if history had taught the gaming world anything, it was that Rare was always eager to develop on new consoles. In 2002, despite a near twenty year relationship with Nintendo, Rare Ltd. was acquired by American company Microsoft, designating the company as a first party developer for the Xbox and all of Microsoft’s future consoles. Since Microsoft made no stake in the handheld gaming market, Rare was still able to create games for Nintendo’s handheld system, the Game Boy Advance, though all their console gaming projects were allocated to the Xbox. The console games they created for the Xbox, however, were not met with the same universal acclaim their previous titles had received. Their first Xbox title, Grabbed by the Ghoulies, a cartoon like beat-em-up style game set within a haunted mansion, yielded mixed reviews by players and critics – a first for the company that held a near flawless resume throughout the ’90s. By the mid-2000s development shifted towards Microsoft’s latest system, the Xbox 360. Titles like Kameo: Elements of Power, Perfect Dark Zero, and Viva Piñata were well received and seemed to represent a slow reform, but behind closed doors the company was in the middle of a significant shift in form. In 2007, it was announced that Rare Ltd. founders Chris and Tim Stamper had left the company for the pursuit of other ambitions. 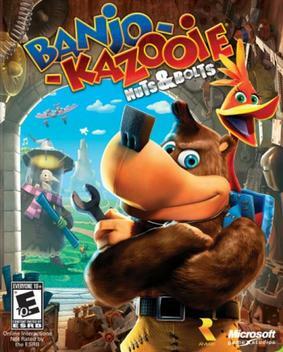 In 2008, the company attempted to revitalize the Banjo series with the release of Banjo-Kazooie: Nuts & Bolts, a vehicle crafting and exploration game starring Rare’s biggest stars from the N64 era. Despite the return of fan favourite icons, many were left disappointed and confused by Nuts & Bolts, as it diverged heavily from the platforming elements that fans of the first two games grew accustomed to. Following the success of motion based gaming seen on the Nintendo Wii, 2010 saw Microsoft push for the release of Kinect, a motion sensing camera that would function with the Xbox 360 to let gamers take control of certain games using their own body movements. Rare was tasked with developing a series of motion based sports games for the Kinect, many of which underperformed in terms of sales, leading to significant layoffs within the company in 2014. Playtonic Games & Yooka-Laylee: The 3D Platformer Reborn? Reblogged this on Button Masher.